This was a complete and total bust. The image above is from Wikimedia Commons. There's one place around here I know has wisteria (the nurseries don't generally carry it, maybe they have it, maybe they don't)...it's in front of a vacant lot. I went there today, since it was en route to the local Target. Editor's note: those Go! designer collections aren't bad, although you do have to avoid anything with a ginormous logo on it. I got a few of the Proenza Schouler tanks and short-sleeved tops last time around; they're nice and soft, look better than regular old tanks and short-sleeved tops, and seem to be wearing well after several washes. What they have now is Libertine; I got the puffed-sleeve top (it's way cuter on than it looks online, it's fitted and the neck is scoopy) and some of the lace-inset Indonesian tanks. I even brought my camera, hoping to take a picture of the wisteria. I realized, in reviewing Diptyque Olène, it's been years since I smelled an actual wisteria flower. It's probably been more than twenty years. I have a fairly strong memory of the scent, but why not smell the real thing? Once I got there, I could find only two, dilapidated blooms. Wisteria in the South, I'm sure of it, blossoms the entire summer. Bleh! And they both smelled terrible. I got a tiny bit of real wisteria (and haven't changed my assertion that Olène does not smell like wisteria) but not that dense, wondrous cloud of scent. Oh well. I'm betting Berkeley has wisteria. 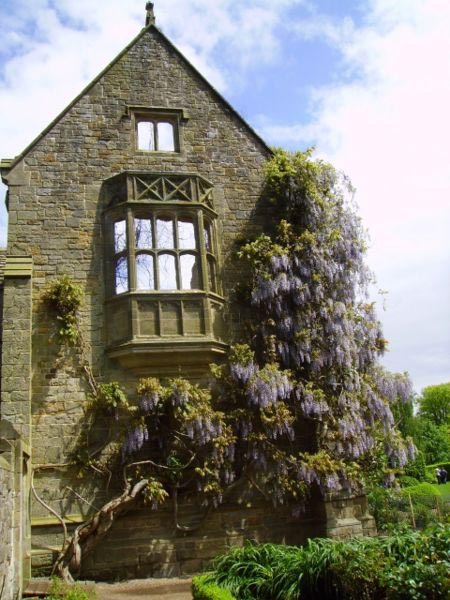 Can you imagine, a Southerner looking for wisteria?